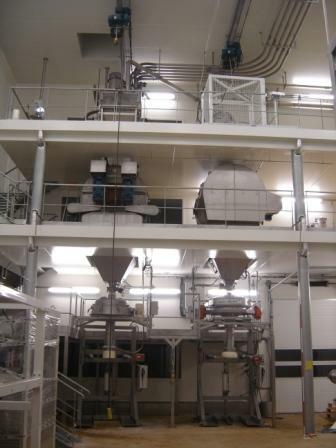 Palamatic Process, Brece, Brittany, France, has supplied a world-leading pet food manufacturer (catering primarily for dogs and cats) with a mixing line for additives and premixes. A new dry bulk material mixing process was required to improve the mixing performance of the plant and increase its productivity. Palamatic Process designed a custom-engineered solution for preparing premixes from several types of powders, into a pre-weighed hopper. This feeds the mixer and afterwards the dry-mix is loaded into bulk bags. Five bulk bag stations, named EASYFLOW EF01®, have been set up to handle these different dry bulk materials. The bag spout is clamped to the outlet spout before the bag is opened, thereby eliminating material spillage and operator exposure issues. To prevent dust emissions, the access chamber is connected to a blower unit. The raw materials are fed into the 1300-litre capacity pre-weighing hopper by a dense phase vacuum conveying system. The cyclone separator, mounted on three load cells, is installed at the top of the hopper to ensure precise dosing of the product. The premix falls into the mixer which homogenises the recipe while respecting the product’s physical characteristics. A 304 stainless steel hopper and 1200-litre Teflon liner is connected to the mixer through a BFM flexible sleeve connector which is ideal for food applications. At the outlet of the hopper, a GSC900 vibrating sifter is positioned to eliminate all potential foreign bodies and ensure a clean recipe. The design of the vibrating screen has no retention zone and its flange facilitates easy assembly and disassembly by the operator.